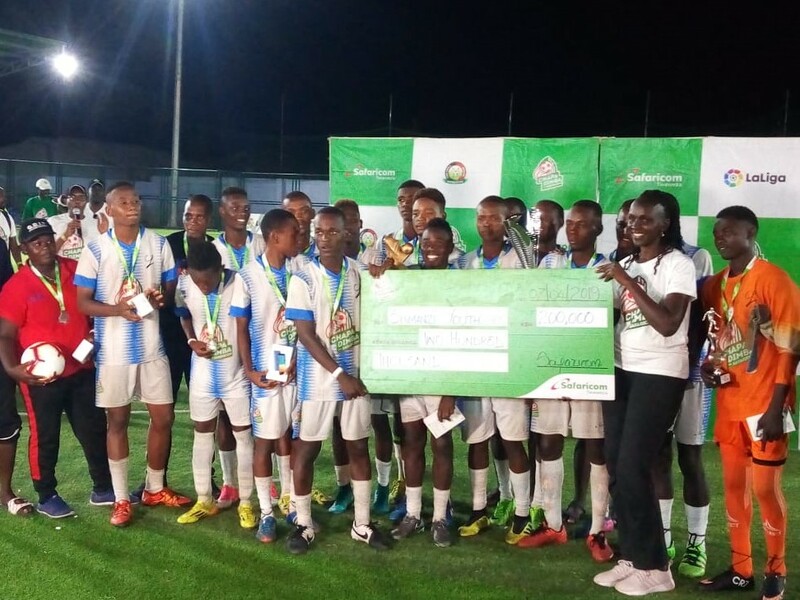 Shimanzi Youth and Changamwe Ladies are the winners of this year’s Chapa Dimba na Safaricom Coast region finals under floodlights at Sh86 million Bomu Stadium with a sitting capacity of 3,000. Triumphed after putting up a skillful, Shimanzi Youth, displayed a fighting spirit that saw them run over Maweni United with a 2-1 margin within the stipulated time. Cedric Asmani of Shimanzi Youth was the first to draw blood with a superb killer at the 35th minute before breaking for the First Half with their shoulders held high. In the second half, the rejuvenated Shimanzi lads threw out more runs and within seconds of resumption, Safari Juma received a surgical pass and without ado stole the second goal sending their supporters into frenzy. Downtrodden but not intimidated Maweni United lads continued pushing and attacking the relaxed Shimanzi players before being rewarded with a 74th minute goal through Okwaro Dennis forcing the opponents to change tact as United pushed for an equalizer. Shimanzi held their selves until the last whistle sending them craze in celebration. Each of the winners received a cash prize of Sh200,000 and also booked slots in the National finals slated for June this year. Runners up pocketed Sh100,000 each while the received individual prizes. The competition now shifts to Thika for the Central regional finals slated between 13th and 14th of April. Already Bishop Njenga Girls and Lugari Blue Saints from Western, Super Solico and St Mary’s Ndovea from Eastern, Kajiado Alhly and Kitale Queens from Rift Valley, as well as Manyatta Boys and Ndhiwa Ndhiwa Queens from from Nyanza have booked their tickets for the June national finals.